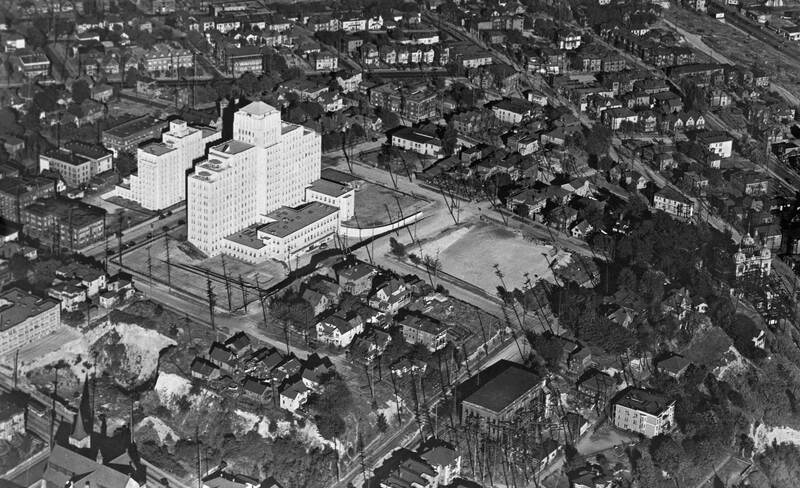 This aerial of the First Hill neighborhood around a nearly new Harborview Hospital is included here because it also shows the Seattle Day Nursery at the northeast corner of Broadway and Boren and Alder. This Sunday’s “now-and-then” features Childhaven and is printed here directly below this short description of the aerial photograph. The nursery appears far into the upper-left corner. I confess that so far I do not know the year the aerial was taken. I am, however, confident that there is enough “information” in it to determine the year. Hopefully a reader will figure it out before I do. I will note a few of things only. Trinity Episcopal Church shows at the bottom left corner – at the northwest corner of James Street and Eighth Avenue. On the far right is the fanciful architecture of Seattle City Light’s first substation, located near what would have been the northwest corner of Yesler Way and Seventh Avenue, had Seventh been graded through that steep portion of First Hill. City Light’s competitor, Puget Power, appears bottom center with the big dark roof and “forest” of power poles. The Seattle Freeway runs over it now. The steepest part of the hill appears as a white scar between Trinity Church and Harborview. This was a cliff. The aerial’s upper-right corner includes a short stretch of Jackson Street around Ninth Avenue. Between 1907 and 1909 this section and much else endured the Jackson Street Regrade, which both lowered and raised parts of the neighborhood now variously called Chinatown and the International District. Of course, this aerial – looking to the southeast – includes many surviving structures that I have not pointed out. But, again, neither have I conclusively dated it. The first 700 units of Yesler Terrace were funded in 1939. A repeat aerial – a “now” – would show their pattern covering much of the right side of this aerial, which is here still variously crowded with Carpenter Gothic classics and a few cheaply built homes that during the Great Depression turned to shacks. Amazing that an honest-to-goodness cliff survived for so long so close to the city center. Great shot. And they sure don’t make substations like that anymore. No they do not Ben. I have – somewhere – a 1880s panorama that “hints” at that cliff. So I am pretty sure it or some part of it is older than settlement. When I come upon it I’ll put it up. I am conflicted about this. Should I go back to the original story and add it there, or should I put it up on its own at the “top” of the list with a reference or link to the original story. I think probably the later for it gives it better exposure and also gives the story a second running for new readers. What do you think? I’m with you — the latter. These are remarkable photographs!!! I grew up in Seattle, as did my Parents. My brother was born at VM, my folks entered what was the main entrance to reach Maternity. The changes are incredible!!! Thanks for all your hard and dedicated work!